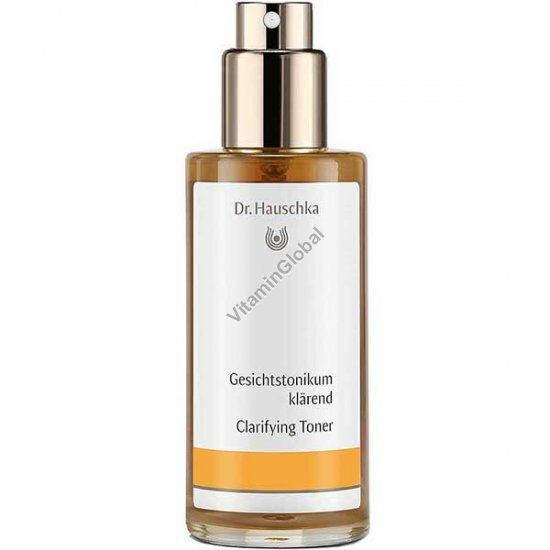 Specially formulated to nourish oily or blemished skin, Clarifying Toner gently stimulates the skin’s natural processes, giving your complexion a rosy and vibrant radiance. It balances excessive oiliness, soothes redness and irritation and minimizes the appearance of blemishes, blackheads and enlarged pores. Ingredients: Water (Aqua), Alcohol, Anthyllis Vulneraria Extract, Calendula Officinalis Flower Extract, Tropaeolum Majus Flower/Leaf/Stem Extract, Aesculus Hippocastanum (Horse Chestnut) Bark Extract, Echinacea Pallida Extract, Hamamelis Virginiana (Witch Hazel) Bark/Leaf Extract, Bellis Perennis (Daisy) Flower Extract, Fragrance (Parfum)*, Citronellol*, Geraniol*, Linalool*, Lactic Acid. Usage: After cleansing in the mornings and evenings, mist Clarifying Toner onto the face and gently pat it into the skin.